Always worked before, pretty well, but now gets half done and returns to home screen. Tracking seems to be a problem! My last update was 48 hours ago? I don’t think they quite know what tracking a package is? This has been no help & I hate when a company uses USPS! It’s not worth paying extra for something you know will take a long time to deliver! However, if my package was in NJ just 48 hours ago? Should I not have it already or at least, know where it is? Not a useful app.! Informed delivery is great! It helps prevent others from going through and taking your mail. Great service thank you USPS. I’ve been using this app for years and it has its flaws, regardless of my having the latest version. It can’t seem to handle tracking more than one package at a time, while older versions of the app could. Even when I type in a new tracking number, it will still only bring up the previous package. It often has incorrect information. For example, I was tracking a package that said it would be delivered on a Saturday by 8:00pm. I received an alert that it was going to be delayed; no reason was given, nor was an estimated date/time. I continued to get this error for 5 days. I knew from past experience that you need to wait a full week before you can file a complaint. Finally, late on the 5th day, I got a msg saying the package HAD been delivered on the original day at 2:15pm. Why the app wasn’t updated in a timely manner I’m not sure. That’s the government for you! App works great , but would like to see like a delivery notification that the mail was put in my mailbox or something like that . I have 0 issues. Using on iPhone 8+ on iOS 11.4 (as of this writing). Tracking works sometimes, sometimes not! When it works this is a useful app. The problem for me is that tracking rarely works well. I remove entries as they are delivered so I don’t exceed the number of tracking numbers that the app can handle but it often only displays one item. I can’t believe the resources of the USPS can’t do better than this. Can't access account in app. Informed delivery is a hassle to register for. Would rate 0 stars if I could. Trash. They still can’t track your stamped mail by the scan. I thought using this program to keep track of USPS orders related to my job would be convenient, but I’ve learned my lesson. If you try to add tracking information too quickly, the program isn’t best optimized to handle it. Not only that, but it will decide on its own that it just wants to get rid of all the rest of the tracking information you had stored. THIS HAS HAPPENED TO ME MULTIPLE TIMES. If I could rate this program 0 stars, I would. You would think with it being The United States Postal Service they could put more money into this app and at least make sure tracking information NEVER gets deleted, unless the user does so themselves. If you plan to use this program to keep track of multiple tracking numbers, just write them down. DO NOT DOWNLOAD!!! It says the package will be delivered by 8 pm on the 12th. I sit home and wait.........nothing. On the 13th, it still says the package will be delivered on the 12th. 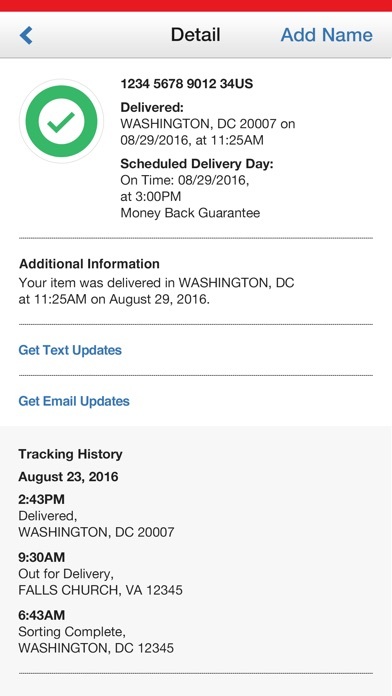 Don’t waste time waiting at home for a package based on this app. Let’s just say this it’s great when it works. The majority of the time it’s inaccurate. You may be notified that you have 1 piece of mail when in fact you’ll have more or none. Extremely frustrating!!! Can’t be relied on. Wait. I can’t print from the app? Wait. I can’t print labels from the app? Am I missing something here? I had to email myself the label from the app THEN print it out through the email app. Come on USPS! I know that y’all are trying to be a more modern company....TRY HARDER! Works but I have to sign in with user name and password every time I open the app. Don’t see any option for Touch ID, unless I’m missing it? I love using this app because it is very convenient but what would make it much better is if it could save your login information so you don’t have to manually sign into the app every time. CAN NOT USE CLICK N SHIP!! It never responded after you sign up! It simply won’t track a package. I copy and paste the number. It says I’m already tracking it yet gives zero information. I downloaded this so I could easily order boxes without having to go to the website but that is not an option in the app, that I can tell at least. I wish it was. If their is a way please someone let me know. 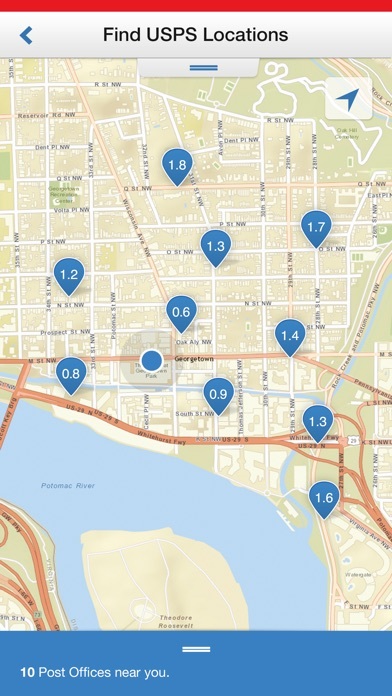 App is ok for the most part, but some areas like the tracking portion need some serious work. You can track an item and if you back out to let’s say reply to a text and go back into the app, you will receive an error message stating the app has technical difficulties and to try again later. You can close the app completely, shut off your phone etc. nothing will help. You literally have to wait an hour, try again and you get the same exact thing. Poor rating of 1 star for now. This app is just like the actual USPS. It only works half the time. Constant server errors and bugs. Come on already. I don’t see that It is working. I have tried to send my information about a missing certified mail. However, I don’t see it that is working because it doesn’t give any that the confirmation has been received. Trying to sign into my account and keep getting that my account is disabled. But, I can get in fine on the computer. When I tried to complain I got an error that my address was wrong and then app froze. 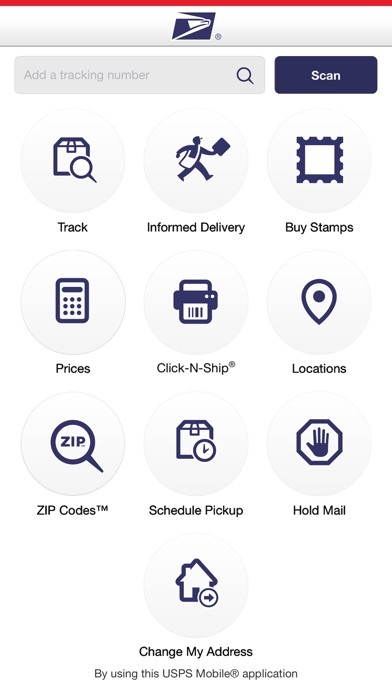 I got this app so I could utilize the QR codes on the slips USPS leaves when you miss a delivery. I have requested redelivery on three packages in a row and none were ever redelivered. When I went to pick up each one, the local post office had no record I ever made a redelivery request. Useless. I want to see my option to ship first class for items 13 oz and less. USPS continues to try to hide this option at bottom of website and does not show it at all on this app. Nor media mail. Signed up for informed delivery. App requires a fresh “sign-in” with EVERY access‼️ I’d like to inform the developers of a tool that is no longer a secret: Apple offers a feature called “Touch ID.” Maybe the developers could learn to use the tools that Apple makes available to competent developers. Convenient, easy enough. Would prefer not to have to sign in every time I open the app. It’s not good anymore as it used to be. It works well but is a bit hard to understand. Works great I get tracking updates via text ! Very helpful app BUT it needs to be updated to allow Touch ID sign in. App will not allow one to stay signed in so it’s irritating to have to sign in each time. I usually only get informed of 1 piece of mail or none at all even though I end up getting more than they’re showing. This app would be good if they actually informed you of the mail you’re getting. Horrible follow through by USPS. This app is a waste of time. Nothing but the mobile website. It would not even remember the login. I love this app. Let’s me know when mail/pkgs are on their way. If mail is not delivered in my box/front door then I can begin an inquiry via the app. Only thing that is annoying is that the app will not allow you to stay signed in. It would be great if Touch ID could be added. That’s even more secure than being able to staying signed in. Printing a shipping label from the app on iPhone is a disaster! After the last update, the app always crashes on launch when you try to open it from the widget, so now I can no longer click the tracking update for a package and have it launch right to it being open, and have to reopen the app to get to it. No not the end of the world, but quite annoying seeing it used to work flawlessly before this last update was put in. Great app, I love the informed delivery feature!! This app needs a huge update! I can not log into my account. It’s ok, but it doesn’t automatically detect my packages like UPS & FedEx apps do Also, when trying to launch the app from the widget, it crashes every time. Under “informed delivery”, it has been saying I have zero mail for the past week while I have mail every single day. Even with latest update the scan feature doesn't work it scans then has an alert ‘Are you sure you want to leave the app’ thats all you get! If you type in tracking it fails also. Its like the online update a total flop!! Govt. failures. I like your app but it would be greatly appreciated if y’all could allow Fingerprint ID to be able to get into Informed Delivery. Then it would be a great app. It acknowledges a new tracking number but never keeps up with package progress or current location. Then the package arrives where the app still shows it hasn’t even been shipped from original location. No value or reliability in this app. Don’t waste your time! I received the mail I was tracking but it didn’t show the correct status. It just kept showing errors. Worked great until the update.. I use this app daily to keep track of all my incoming and outgoing packages as part of my job. I easily scan the qr code or the barcode and it saves it in my history until I want to delete it. I can edit the name of the package so i can tell which is which package. After the new updates recently, it’s all jumbled with my custom package names gone and everything out of order. Also “status not available” on an item that’s already been marked as shipped with USPS and on another item that I had returned to a company that no longer shows the tracking information, so I have no idea if they received it or not. Please go back to the old updates.. for the sake of myself or I will just use another parcel tracker app and quit using this app for good. Literally broken. Click N Ship will not accept standard US street address. Ignores rate selection and forces to flat rate. So they keep updating this app without fixing what I consider the worst glitch in this thing. I run a business and sometimes away from computer I need to schedule a pickup but this thing just won’t do it. It will take me to the second or sometimes even get to the third screen and I’m almost done and SNAP it sends me back to the starting screen. Very frustrating app! Before they made the update this was a great app. Now it freezes every time I load it. Since the new update I cannot get the informed delivery to work. It worked fine before that. It won’t load and I can’t log in. Please fix it! This is the slowest app I have ever used. I think it needs a lot more work. I’ve had this app for quite some time now. A couple things are wrong with it. Signing in is a pain. It takes a number of steps for you to get into it when most apps nowadays you can just sign in by Face ID. The next issue is many times it will not even open. I just checked the last update and it was six days ago so what’s up with that? I’ve been trying to get into the app and it’s not allowing me to do so. I’m thinking I may have to delete and reinstall it again. I wish developers would check their own apps to make sure that they’re working properly and if there are any glitches they would fix it. At first I didn’t think my tracking numbers were actually being saved but, by chance, I scrolled down to find that the newest tracking numbers are now at the bottom of the tracking history. The app now shows the oldest (delivered) tracking numbers first. If you have a large history, that’s one heck of a scroll to find your latest tracking numbers. This change occurred after the latest update and if there is a way to change the sort order, I’ve yet to find it. Just out of shear curiosity, I’d love to know the thought process that got to the idea and implementation of this change. Lost all my custom names! I’ve used this app for a long time for tracking packages I mail to customers. It’s always been very glitchy. This last update has some welcome features like deleting multiple items, and allowing longer names. BUT, I’ve now apparently lost all my custom names on 25 entries showing what the item was and destination. SO FRUSTRATING! Any way to fix this??? Why is that literally every app created by a government entities fails to work? Tried to sign up for an account, and after entering several pages of information I got a grey “loading...” page that never went away. I tried again but it told me my username, which is my email address, was already used, so I tried to sign in using my username and password, but it now tells me that username is not recognized. So my username both isn’t recognized and is already in use. So typical!!!!!!!!!!!! Though at times there is a one day delay in what you see as compare to what you get in mailbox. But other than this it’s a really useful app. I got this app to see when I would receive my mail, and each time I were to look at it, it told me that I would eaither create a new account or my username or password wasn’t the same. Regardless of its stated compatibility all the way down to iOS 9, it is not. This app has suddenly stoped working overnight on my iPhone running iOS 10. I've tested it on a few iPhones running iOS 10 and iOS 9, and they all have the same issue. It only works on devices running iOS 11 or later. Seems like every revision of this app continually got worse up to the point of not working at all. I’ve used the app for years and never has an issue. Now I just can’t see any of my tracked packages. Even when I input the tracking number, it gives me a message that I’m already tracking the package, but I cannot see any information on stays or anything. Please fix app - for now I have to go online to view info. Thank you. I wish this app would stop logging me out. Take a cue from the UPS and FedEx apps and let us stay logged in! Instead of opening a webview into a clunky webpage that’s barely responsive, why don’t you make an actual iOS view controller that displays the Informed Delivery information & photos of the letters in a more native iOS interface? Fix that, and I’ll give you 5 stars. I say at least 50% of the time I try to use this app, there is some sort of “error“ and I cannot track any packages, add new ones, or search by number. I am sending packages all the time, and my experience with the physical. Post Office is great, but this app definitely needs some work because it seems to be crashing intermittently throughout the day almost every day. App use to work so well. Now it doesn’t even save your tracking numbers. I tried to scan a code. But it forced me to take a survey. Are these people insane? The app is nice when it works but, it displays a message that it’s “Having Technical Difficulties” more than it actually works. Signed up with Informed Delivery, went to local post office and had them verify my identification. Signed in via this app and its says I have no mail arriving, when I receive mail almost daily. Worthless, don’t waste your time with this garbage app or the “Informed Delivery” app from USPS. App needs to be able to access contacts on your phone so you can create a label from contacts on your phone rather than typing in the information. The printing from a phone is a pain, at least create the ability to email yourself the shipping label so you can print from a computer later in the day. They updated the app but Informed Delivery is still just a browser window where you have to log in every time. I enjoy the app but I entered a tracking number of a certified letter and when it was returned to sender I tried to delete it. It won’t let me delete the tracking number of a letter that was marked delivered on November 17, 2018. Now every time I go back to the tracking page it says I’m already tracking a number and it shows the same delivered number twice. I can delete on but the other stays. Then the next time I go into the app it starts again. I can delete one but not the other. It’s annoying and I can’t find a way to contact anyone about it. I just want tracking number 9414814900006478469659 to go away from my app. Why does this app only work in portrait mode? Why does this app only work in portrait mode? I frequently track my packages and order stamps from my iPad which sits in landscape mode. I have used this app for years & honestly have never had a real problem until recently . In the last few months it won’t allow me to paste tracking numbers and when I do try , the window where tracking numbers are placed doubles . Tried informed delivery option, got this instead. Back to the browser I go... Error 500: Context: eagnmncom1a5eNetwork/clusters/rmincluster, name: /ejblocal:ejblocal:RminEAR/RminEJB.jar/ConfigurationServices#com.usps.utils.ejb.session.ConfigurationServicesLocal: First component in name /ejblocal:ejblocal:RminEAR/RminEJB.jar/ConfigurationServices#com.usps.utils.ejb.session.ConfigurationServicesLocal not found. Love the app but please add Touch ID log on. this f...k application does not working at all! fully garbage! I’ve been online shopping for many years and for a lot of expensive stuff and they all come on time and I love my mail man and lady and the workers at the office but I’ve never had one problem with USPS unlike UPS FEDEX etc I love this company and sticking with them till the end The APP is phenomenal it’s on POINT all the TIME you can not get know better and the NEW Update is remarkable keep up the fantastic work USPS!!!! Fix released 2 hours ago -- it is STILL NOT WORKING! Fix released 6 days ago -- it is still not working. Obviously, this app is in no way a priority for the US Postal Service. It is down with such frequency that it is simply worthless. Horribly unreliable. DON'T count on this app to work. Have used this numerous times to Hold my mail. Sometimes it works, but about half the time it does NOT. You will get email confirming the hold, but they never stop delivering it. Filed complaint on USPS website and got call from local post office. Even though I had received a confirmation email, they could not even hold mail. Just gave me another number to call, but it has limited hours. Called them, but message said to call back next week. And the postal service wonders why they have such bad reputation. Reliability has NOT improved, but that is a problem with the post office. USPS is completely useless. Every package ever sent through them has never arrived on expected date. I am a big fan of the Post Office, and since I am disabled and homebound, this helps me hugely. I can do nearly everything I used to do in person. Thank you for this free app, Uncle Sam. The most Recent update ( v5.22 ) very buggy. On IOS 12.2 the update icon at the bottom of the Tracking Page doesn’t update, It just shows updating but never updates. On IOS 9.3 the Tracking page doesn’t work. It brings up packages, but only brings up blank tracking progress icons and clicking on the tracking numbers doesn’t do anything ( ie bring up the package info ). There is no update icon on the page bottom. Also unable to delete tracking numbers as no delete box or trash icon on page bottom. Suddenly I cannot locate zip codes and zip+4 when I use the address feature. I can input everything related to the address but the search bar does not highlight allowing me to get the complete zip code. Thanks!!! The updated you just sent out didn't correct the problem I described!!!! Hi, since the 2 update ago on your usps app, i can’t see any tracking, adding or deleting old tracking, need help because the app its not works.Another update and still no work. This app was very useful for me until the most recent update a few days age and it seems to have broken everything. It looks up after I put in a tracking number, I no longer have any way of saving or deleting tracking numbers. The little x above them is now just a box. I can. Ow longer switch tabs. It is all around flat broken. I hope this is not an issue for every one. I have tried to delete and reinstall it several time to no avail. I would be happy to give it five stars and have if it worked like it used to. Put all correct information but, keeps not accepting. Cannot track packages after the updates!! Cannot track packages any more after the update! In trying to find a blue collection box, I was directed to the address of a large supermarket in a large shopping center. After driving around for several minutes, I determined there was no blue collection box at this address. I uninstalled the app as its pointless. Luckily what I was waiting for arrived but I was uninformed by the app. Which was why I signed up for it. It all sounds good if only it did as it said. Technology isnt all its supposed to be cracked up to be. I will stick to trusting the USPS workers to do what they should and not need an app to be a watchdog. There seems to be something wrong because I can’t even get in to my account. Minimum functionality cannot recommend USPS drop off point or have a package held at post office for delivery through this app. Unlike UPS or DHL or FedEx when you use their app you can request a location change at one of their drop off location stores or directly at a main hub for pick up. Since the new update, the refresh doesn’t work on the tracking page. It says “updating” but just hangs and doesn’t actually update the tracking page. I now have to back out to the homepage, then go back to the tracking page to get tracking to update. Used to work flawlessly until the latest app update. Every update is better in some areas, worse in others. Latest bug : the refresh botton at the bottom of the tracking page fails to work...just sits there and spins. Is there ANY Quality Control ?? The app and website say I do not have a PO Box. I’ve had one for the last 25 years and I was just charged for a renewal. Spoke to an idiot from the tech department and all she could say was that it was a mystery to her. Meanwhile I’m unable to manage my box online. Incompetence at its finest. Love that informed delivery is here, as well as anticipated packages. It would be nice if they could add Touch ID to informed delivery login. I check it 3-4 times a week so I know if I do or don’t have to go to the PO Box. I really enjoy using this app, let’s me know what’s in the mail for today. What would be nice is to be able to clear out old mail like a reset button. I don’t need to look at mail that was delivered 2 weeks ago. Otherwise app is pretty nice. It wouldn’t even let me sing in. Don’t waste your time, installing app...just check on line. I can track my package, but I can’t do anything about it. I can’t respond to actions needed, request re-delivery, or anything. This app is nearly useless. Just use the desktop version, and avoid this mobile app. It’s garbage. Where is my Held Mail? The informed delivery is a pretty cool idea, but this part of the app is clunky and does not work very well. Every time it starts up the informed delivery it will ask if you want to extend time and then gives an error. It makes you go through multiple login screen. It lets me delete a delivered package, but not the letters. this app is a mess... or is the post office a mess? according to this app, ive seen many of my pkgs get to my local post office, only to leave back to the "regional distribution center" far away. happens very frequently. according to this app, the post office is a mess. i've seen my pkgs go backwards in the process, get delayed, arrive at the local post office 3 times in 1 week and not get delivered. wish i could do a screenshot to show the lunacy with the postal system. i'm sure there is much to the process that i don't know or understand currently. not sure what the problem is exactly, but the usps has been in business for a real long time, to be demonstrating such unorganized business practices on such a regular basis. almost not worth it to track your pkgs, unless you enjoy stress and seeing one of the most unorganized systems at work. usps, get it together, you've been hanging on by a thread for years now and it's clearly about to break. usps is being left behind as the rest of us move forward with technology, process and procedures. please get it together. other options are looking more and more enticing with each of my pkgs i watch wander my state aimlessly. I enjoy the convenience the USPS mobile app offers; however, for the past week (beginning March 23, 2018) it has been malfunctioning. Please review the app; the recent update may be causing this problem. When the problem is corrected, my star rating will change. Why on earth would I have the app to scan receipt QR codes if it just redirects me to the website...? Not to mention it redirects you to a survey, nothing related to the shipment I’m trying to track. Are you kidding usps??? Please cancel my earlier review. Don’t download. It’s a waste of time and space. Pretty solid app, pretty useful. But since I’m able to use it to log into my account, I need it to have the ability to order/reorder shipping supplies, like Priority Boxes. Worthless compared to UPS and FedEx apps. Informed Delivery does not work in app. I do not get notifications about incoming packages. Completely pointless. It would be nice if this app would have the dashboard, attached to the homepage. It takes a little while for this app to load, I do feel as though it needs a little bit more TLC. Everything literally just takes you to the USPS website. (Why did I download this application if it just sends me to the website? )The app developers really do need to take their time with this app. When tracking down a package, screen freezes and closes the app. Hope the developers take into consideration of the improvements the application actually needs for the customers. I used to love this app, esp the tracking & PO location functions. Over the last couple weeks, tracking has stopped working — won’t keep multiple items saved on the tracking page any longer, won’t allow deleting of an old tracked item, & won’t add a second tracked number if there’s already another item listed on the tracking page. It’s WORTHLESS in its current condition — PLEASE FIX IT!!! It was FINE a few weeks ago — what happened??? APP OFTEN DOESN'T WORK! PROBLEMS CONTINUE!! App will often crash when trying to track. When/if working, only allows tracking of up to 35 items. Expected delivery dates are often wrong. The "Order Supplies" function was removed some time ago and needs to be restored. I wonder if the USPS ever reads these reviews. With so many One Star reviews you would think they would make an effort to resolve outstanding issues ... but they haven’t! I try to scan the code provided and all it does is send me to the website to fill out a customer service survey. Trash. Informed delivery doesn’t work, so my impression is this is just a citizen tracking platform, not a mail tracking app. Downloaded app to scan my code to see if my certified mail was delivered. Was rerouted to the USPS website and had to take a survey, then sign up for an account, then after all that it couldn't verify my identity and wants me to verify in person at a post office. Needless to say the app is now deleted. Please allow users to delete old tracking numbers like I do my unwanted emails-I swish them to the left. Right now, it’s too cumbersome to touch the “x” for each individual number and then wait while the entire page reloads. Thanks!! Just a web wrapper. Need to sign in every time I open it. Uninstalling. Something is wrong with the app that needs to be fixed. I used to love this app. I had multiple things I was tracking but once I close the app, I can only see one thing. I’ve tried uninstalling & reinstalling the app to no avail. When I processed the order and ready to print a label it does not give me the option to AirPrint it. It shows me the label in the app, it has obviously populated and charged me for the label but I can’t print it. Instead I have to click the option to open the webpage, which then will display the label and now I have the option to AirPrint the label. Kind of redundant. I can create a label on the app but I can’t print it from the app? Does that make sense? If I wanted to use the webpage then I would have gone to the webpage. Seems an app is created with the goal of making it easier to access the information and more mobile friendly. Maybe that’s a glitch but it was annoying. This app is god awful! Either the app is refusing to update, or Everyone at USPS said screw it and took the week off. Either way, I hope I never have to rely on USPS to deliver a package to my residence again. 3-9-18. Need a 2nd field in the tracking section separate from the tracking number. Name title and numbers should be 2 fields. Please add this week. Thanks! Update 10/9/17 Been a long while since this9 has been updated and still no changes for scanner or numeric keyboard??? Not complicated folks. Andddd, the APP SUPPORT button still doesn't go to App Support. You did notice that right? Fix this week please. 7/6/17. I updated the app and now the SCANNER DOESNT WORK! I sent this recco 6-7 months ago. Thought it would be fixed by now. Also some of my completed deliveries have the tracking info dropped off. ??? Still no numeric keypad to manually enter long tracking numbers. How long should it take to fix that? BY now I thought you would have added a large numeric keyboard IF YOU HAVE TO ENTER THE TRACKING NUMBER MANUALLY!!! Easy change. Also need a separate field or space for ADDING THE NAME OF THE PACKAGE AND NOT INCLUDE IT WITH THE ACTUAL TRACKING NUMBER. Add this to next update this week! Thanks! This is hands down the worst app I have ever tried to use. I was hoping to scan a receipt to confirm delivery. That wasn’t possible without being redirected at least twice and forced to fill out a survey. Horrible tracking service just like usps services. Tracking simply takes you to a website with a long survey then asks me to sign up for a service. What’s the point of the app??? OMG sooo slow to load the tracking history. Will not show tracking history and will not allow me to enter new tracking numbers. App is worthless. Good enough. Could be better. Don’t get me wrong: I favor the USPS above all other shippers and we’ve never had anything but the best of service from the USPS. I wish the app had *sophisticated* parcel tracking. I wish the app would let me login with the credentials I already have at the browser website. That way, I could manage my PO Box account. This is just a rather generic app. The website is more appropriate for most things. I am trying to email about a lost package and when filling out the information the form keeps freezing up and deleting the information. My app don’t have the MY USPS section, can’t even sign in to access my account. This is the first time I’ve felt compelled to leave a poor review. This is a trash app. If I wanted to be redirected to a web page I’d have used the usps web page instead of downloading this app and wasting my time and data. I’m appalled and amazed at the USPS’ ineptitude. I sent gifts out on the 19th of December 2018 and I paid over $70 for PRIORITY Mail. They sat in post offices for days and barely arrived for Christmas. I will NEVER send it through the post office ever again. I will use UPS instead. I have been told by local post office that I can’t have a refund so I am out of money. This is probably never gonna be read by anyone and probably will be deleted. Is there a worse app than this? SOOOOOO many glitches. Had to get refunds after finding it impossible to print from iPhone X. Get your sh*t together USPS. You give democratic socialism a bad name. Figure it out! I wanted to be able to easily access informed delivery (since USPS still hasn’t fixed our building’s broken mailbox and mail thieves persist) and this app is useless for that. It prompts you to the mobile site to login again. Total waste of a download. Don’t bother. Using app 2 years! Never had any problems! I have one package that I’m waiting for and the app nor the web picks it up. It’s unrecognizable. So I went to the people in person and THEY can’t find it. So, I go check the app and it says that it’s returning to sender before the due date on the paper says. The app is as broken as this god forsaken company is. Your app looks appealing but it’s ridiculously slow if it works at all. Kind of like the actual USPS service. Hold mail complaints: 1-The app doesn’t let me select an end date. Can’t hold mail w/o end date. Bug? 2-Also, after years of use...why can’t the app remember my hold mail address? It’s not like I want to hold mail at different addresses on the regular. Just want to be able to quickly hold my mail as I’m running to the airport. 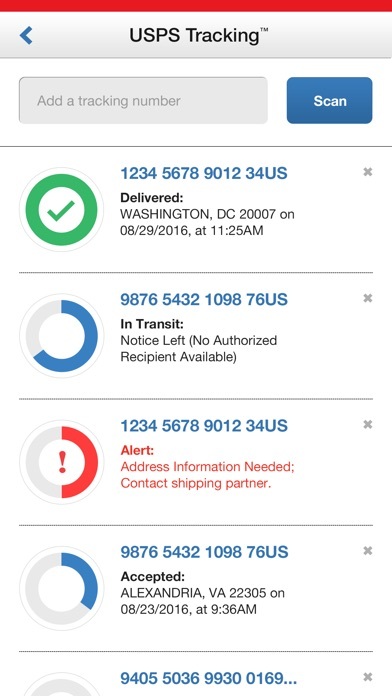 This app reveals the glaring deficiencies between the USPS and a carrier such as UPS. With this app, I can’t change delivery instructions after a failed attempt, I can’t schedule a pickup. It’s incredibly worthless. Great for tracking and other function. But there are too annoying bugs still. Delivered packages cannot be deleted from the tracking list etc. I copy my tracking number from my email, then paste it in the “Track a package” option within the app. Instead, the pasting gives me the link to their site, not the actual number. I downloaded the app and tried 3 times with same tracking number and each time it said it could not be found. I went to the USPS website and put in same tracking number and it gave me FULL details of the pkg in transit. Not sure what’s up with this mobile app, but deleted it. Very slow to load and unresponsive a lot. Informed delivery often freezes and doesn’t load. When it does work. It is extremely slow. Terrible app. You can track packages and change your address. What would make this app worthwhile would be if it could send images of your mail to you through the app instead of your email. Since the last update or maybe the one before that trying to Schedule a Pickup doesn’t work most times. I usually duplicate pickups so I don’t have to input all the information again. I can choose a shipment to duplicate and when it gets to the screen where it’s input shipment details like where it will be, how many and weight the screen slides to the right and it goes back to the app home screen! If I keep at it, this last time took me 6 tries before I was fast enough to select the I agree button and process the pickup. Had this issue my last attempt to. I have used this app for awhile. Bugs usually fixed. Thanks for fixing recent “you are already tracking bug” . It serves it’s purpose for me. As I stated other review, the app does what it is supposed to. Misinformation etc. depends on human input. Timing of entry etc. even if it doesn’t give you everything it gives you a good idea on when to expect. You can always put your mail on hold if going to be away if that helps. I didn’t see my last review posted maybe it will later. Thanks for app. Use it frequently. I love this app to track packages I don’t care if you can’t paste numbers. Poor you guys who have to type numbers. Gosh... what is so bad about typing a number. My packages get delivered to my neighbor (SurePost, I think). It is frustrating for both of us. I tried to send email to USPS through this app (“contact us” link), but it won’t let me even get to the narrative part where I explain my dilemma. It’s just really frustrating. Please help. Last update makes the app unable to track any packages, other than one package was delivered 2 weeks ago. Can’t even add new tracking numbers. Thanks for a useless app. Overall not a bad app, however it would be nice if businesses could login and access the same features such as ordering supplies. This isn’t built like an application. It’s built like a home screen shortcut to a website link. I download an app because the interface is more generous to my iphone and what it offers, this app does exactly what the website does with an apps home screen. I would prefer that it has a full in-app experience. The only mail I see before it delivered are bills, junk mail, and more junk mail. I’ve never seen the delivery from the comic book orders I ordered on a regular basis. Anything bigger than an envelope does not show up in my email/snail mail. I got the app so I’d be home when a package shows up but I never see it. I don’t care to know that my electric, phone,& Cable bill are in my mailbox. I order online & my 1st class & Priority packages from businesses and from the average Joe does not show up. The only thing it’s good for is when I add a tracking manually and even then it does not show a picture. I get a separate email of delivery today. Scanning packages is a nightmare. It shouldn’t take 10 tries to finally get it to work. It’s a slow process. Loops when you try to create account. Useless. Delete. Tracking a package is awful. USPS could definitely learn a thing or 12 from UPS about tracking a package. You don’t get regular updates and the updates you do get are usually delayed by an hour to several hours. It’s made even worse when a package is handed off from UPS. UPS does great to track a package, but if it’s been handed off to USPS, it’s anybody’s guess as to where the package actually is and where it has been. Today, my package was delivered around 1 PM. I didn’t get a notification of delivery until 8:30 PM. Currently, I’m waiting on a package which was taken to the post office and was checked in three days ago. It has been in Virginia since then and the app tells me it will be delivered tomorrow. I am in the middle of the US. I don’t know how they’re going to have it delivered tomorrow if it is still in Virginia. Or is it…? For a company which delivers mail to almost every single house in America, every day, they sure have no clue how to keep track of a package. I’m very disappointed in this App. It appears very simple at first, but if you want to order supplies other than stamps good luck! I will be deleting this one. Why is it that I have to re-enter my hold mail address every time. No I don’t want to pick it from contacts, my name doesn’t start with A. I hold my mail, not other peoples mail in my contacts. I don’t like to type it in each time. I don’t move often, but I hold mail frequently. So why isn’t there a drop down for recently used hold mail address? Because I recently live at my house, every, single, day. I don’t have to pay for make a perfil changes. Tried to track with scan feature, but kept having to go through survey, then had to track manually. Waste of time. Deleted the app. I keep trying to track a few packages I have coming, but the app just stops working and the shows two package tracking area to type in package number. Sketchy @ best. Tried paying my P.O. box never went through then charged me twice. Multiple times says I’m getting mail but never received it. I’m so impressed with this. It’s so much better than the UPS app. It’s a way to stay informed about your package, knowing within 20 minutes of when it’s going to arrive- not just “by the end of the day.” You know exactly when it is delivered and it’s just an overall great app to have. I have the app and it signed me up for informed delivery. I did not want it because people are getting hacked and their identities Are being stolen. I went into my app and it says I’m not signed up for In formed delivery But yet I’m getting pictures of my mail in my emails. Of everything I’m receiving that day or the next day all my business for anyone to see. Do not get this app it will sign you up with out your knowing I keep calling I get all automated Person no real person. I’m going to Post Office on Monday. Watch the News it’s on there warming people of it. I click proceed to payment and it takes me to a loading screen that never ends. This is on the app, mobile browser and desktop browser. Crashes. Freezes. The alert “Loading” lasts forever, literally. Twice I’ve entered all my information. Nope. This app is worth about as much as an ugly penny. The app is good when it works but 40% of the time I get an error saying try back later. When entering a new tracking number an alert pops up saying I’m already tracking it. When deleting old entries, the app stalls after each delete (and you can only do one at a time) and you have to reopen. It’s like this was designed in the 70s. after scanning the track number, the program offers to evaluate the performance of the mail and that's all. I received no emails or no alerts for my delivered mail and packages. I get both almost everyday and never receive updates. I’ve check and rechecked pertinent information and all is logged correctly. Disappointed. It’s bad enough when you pay for Priority Rates and your parcels are not delivered as such. I’ve been disappointed for years with the US postal service and app just intensifies the problem. I have trouble selecting a date range on held mail and it would be mice if I could actually change the date. I’ve tried several different methods being a tech guy but it is not working. Ive lost patience and would rather open my laptop. Please improve this app because USPS could use a descent platform in the modern age. I just hope to receive my packages after the app malfunction. Scan feature doesn’t work. Takes you to a broken survey that you can’t close or get out of, rendering the entire app useless. Total fail from USPS. Don’t even know what the point is. Trying to scan a bar code and it keeps bringing me to a survey that completed twice. Totally useless. This app would be so much better if informed delivery was integrated so you don’t have to manually log in every time! At this point it’s easier to use the website... no point in using the app. I like this app when it first came out but now with the latest updates is getting worse. Crashes, not user friendly. You can’t do anything else. I cannot delete an old tracked package number from the history! I cannot delete an old tracked package number from the history! It’s been in my history since 2/24/2017. And every time I try your web support, it fails and loses all I did and will not allow me to submit it via my iPhone. It’s like the last step to submit is broken so I cannot tell you that it’s broken except for here. I hope you fix orphaned records that seem to only show up in the app. This is ridiculous. It works only if it’s working! Like the tittle of my review says: it only works when the app or the USPS website it’s working... frequent unexplained interruptions, other than that the app works, period. ...because I never have any issues or problems with any service from USPS, and I ship, mail, track, receive a dozen or more packages, envelopes, and correspondence a day, every day. I’ve never ever had a minute’s problem with this mobile app no matter which device I download it on. It always works perfectly for me. I love having this app. I cannot see my mail box from my house and so it’s nice to be informed of what mail I’m getting everyday. If bad weather or ill and I see it’s just junk mail I don’t worry about rushing to the mail box. Downloaded the update to fix the problem of being told I’m already tracking a number when I’m not. Thanks for taking care of that. 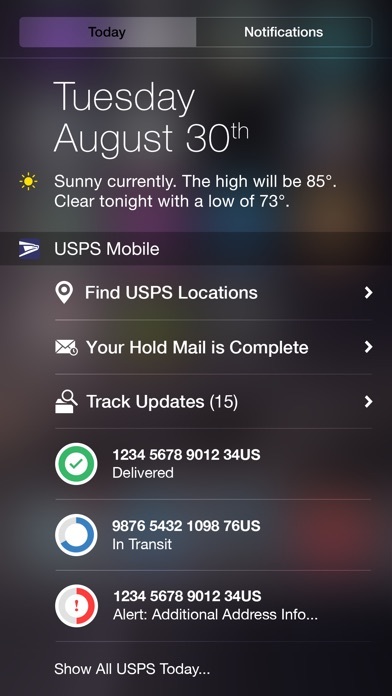 A serviceable app that is very helpful for tracking and confirming delivery of mail items. Used to be just fine. With the last couple of updates, this app can even operate properly. Error at loading, continuous message of already tracked number when I haven’t enter anything. Developer listened and fixed the error. Well done. My review has changed from ⭐️ to ⭐️⭐️⭐️⭐️. Thank you! Developed an issue. Now it shows already tracking warning even when nothing is being tracked. Otherwise pretty viable app. Ie good.. Been fixed, bug is gone. Thanks. I’m usually able to connect and it’s not a processor problem. Tracking a package and getting an update is way, way too cumbersome!! It’s sad that this app is so antiquated, it’s 2018 ladies and gentlemen! UPDATE: DEC 12, 2017: totally useless app now. I cannot access previous tracking history. When I open the tracking section, only one tracked item appears—a different one every time I open it. When I enter a new tracking number, it disappears. I am unable to track any packages. Please fix this. For a while now I get a “you are already tracking this number” alert EVERY TIME I open the tracking part of the app. Today, it only opens the tracking to the number I just entered. Not the others that I am still tracking. Easier just to go to the web site. Very frustrating. I have used this app for a long time. It used to be better than it is now. Come on, where’s the fix?? Thought it would be great especially around the holidays. Most days it doesn’t work, don’t waste your time! The functionality seems fine, but (like the USPS website), the utility is not very customer-centric. You can’t track packages you’ve sent without a tracking number (which you can’t access through the app...even if you used the app or website to send the package). You can’t track your account activity or purchases. Just not helpful. Please update iPhone app so I can request a hold on my packages. I work long hours and I worry about my packages getting stolen, especially during the Holliday season. If USPS app would implement options for a specific day within that week, that would be even better. UPS, allows its customers to request a hold for free, but the package must be picked up before the deadline given. Please consider following in their footsteps. NOW......an even worse update this time!! Finally convinced me to just DELETE this app ! Every time I enter my info for a pickup at my house it lets me get to where you pick the location of your package then it goes back to the home screen. Fix this ASAP it takes about 5-8 times before it works. App is nice but would like to have a way for it to either save my login info or be able to sign in with my Touch ID. Pain to log in every time with user name and password. The app works well enough on my iPhone but it apparently was never intended to work on iPads. For one thing there is no landscape mode capability, which makes it difficult if not impossible to use on a iPad. I think the USPS would get a lot more customers for this app if they made it iPad-compatible. I hate when someone sends a package through the usps with a tracking number that i cant use because the app will not allow me to track it. 90% of the time it says i don't have access. would be nice to be able to track my packages and know when they are coming. app has gotten so hard to use it is ridiculous. The app does not recognize my login. I’ve tried several times. I ended up going online with my laptop and was able to login without issues. Not convenient if I can login to create a shipping label. Y’all really need to fix the app. I’m trying to go to my account but won’t let me. Yeah it’s kinda useful but it’s not at least 80% right. So please fix it or something. The point of using an app is to have the main functions of the website cleaned up, catered and customizable to a mobile device along with its user. This app redirects you to safari -to then login & shuffle through the website ... annnnnnnoyyying. I should be able to login into the app and stay logged in to my online account. I should be able to click on "track a package" and all my outgoing and incoming shipments auto populate the dashboard through the app. Half the time I have to manually add tracking numbers ... I should be able to see more info on the sender; I have too many packages to keep up with I need to be able to access them quickly and know who what when where all in one spot. BAM! I should be able to receive accurate notifications for shipment status . It's such a hassle going through the website on my mobile device it tends to run extremely slow and it is not always mobile friendly . I've resorted to using a 3rd party package tracker fore it is more reliable and alerts are instant and up to date; where is USPS text notifications come in when ever ... grrrr. I like my 3rd party tracking app even more because they have a little map as to where my package is . Similar to amazon. Makes you log in each time via it’s built in browser. Needs to be updated.. it’s 2018 not 2009. Ever since the update it doesn’t work good. Won’t show daily delivery. Wish they would have never messed with it. The Tracking # in the tracking section is Cutoff and doesn't let you see the whole #. If I have to enter my credentials EVERY TIME I want to access my delivery status, then I say F...NO. Completely disfunctional. Fix it or leave it. 1-24-2019 I thought by now these issues would have been updated by now. What is taking so long? 3-9-18. Need a 2nd field in the tracking section separate from the tracking number. Name title and numbers should be 2 fields. Please add this week. Thanks! Update 10/9/17 Been a long while since this has been updated and still no changes for scanner or numeric keyboard??? Not complicated folks. Andddd, the APP SUPPORT button still doesn't go to App Support. You did notice that right? Fix this week please. 7/6/17. I updated the app and now the SCANNER DOESNT WORK! I sent this recco 6-7 months ago. Thought it would be fixed by now. Also some of my completed deliveries have the tracking info dropped off. ??? Still no numeric keypad to manually enter long tracking numbers. How long should it take to fix that? BY now I thought you would have added a large numeric keyboard IF YOU HAVE TO ENTER THE TRACKING NUMBER MANUALLY!!! Easy change. Also need a separate field or space for ADDING THE NAME OF THE PACKAGE AND NOT INCLUDE IT WITH THE ACTUAL TRACKING NUMBER. Add this to next update this week! Thanks! I have been using this app for a long time it is good to use to notify when A package has been delivered but when they post that it’s going to be delivered at certain day it never happens it’s always delayed by a day or 2+ they also will send you a notification at three in the morning but it doesn’t show up that day. The app seems very put together. Unfortunately it is tethered to an apparatus that seems fundamentally flawed. My insured package did not arrive on time. The text updates for tracking did not arrive in a timely manner. Good luck. I have an important letter that I sent first class certified mail with tracking. It has been about nine days and still not arrived. I followed the online link to the form to send an email request for follow up. After filling out the complete, long form there is no Submit button. I have to mail a lot today and the app is not working. I tried tracking, scheduling a pick up- all blank pages. Clicking manage my move on mobile or in the app itself loads a white screen. In chrome and safari. Even requesting full site doesn’t work. Clicking app support takes you back to main USPS page. Useless. It’s limited for sure... and I’m not sure why. Example... if you create a label on this app, and aren’t next to a printer... in order to print the label, you have to sign in on a computer rather than just being able to get it from your phone’s app. Needs to be rethought again. This app is not great keeps saying that not in the system even tho is is use PARCELTRACK app much better. The worst site I have ever tried to use! Must be idiots developing this app! Seems retards developed it! Unable to make sense out of it and actually use it! It constantly crashes and never loads or updates. So much for the tracking scan. Completely useless. Every time you scan it takes you to a survey. Frustrating as hell. Ended up deleting the app. I noticed that packages I already picked up would show they were delivered, but then later the app would have a weird notification like, “label not yet created” even though it was showing that it was delivered previously. I think the app might have bugs or something. Or the app doesn’t match the status of the package with the status on the USPS website or even the status on the online store that I purchased the item. There seems to be a problem with syncing or communication between the app and USPS. Perhaps the app developer needs to update or upgrade or fix the app. Chrome doesn’t save passwords on usps’s site so I tried this app. It’s useless. The app and website do exactly the same thing—not saving passwords—so there is no reason to ever use the app to improve upon just using your browser. When it works, it’s great! Sadly, when I really need it...it doesn’t work. When I enter the information in the To: section, hit continue it just stays there...stuck. Please fix it, I want to be able to use! Created a username and password, then went back to log in. It did not recognize it. Try to recover the password, it said can not do it and creat a new username. I chose the same username and it said it was not available. I am trying to tell USPS that a package that they claim to have lift on my cluster box wasn’t there. I only have my smartphone, and the regular USPS website doesn’t work with it. I did not find anywhere that allowed contact. I attempted to track the package without success. I entered the tracking number into the tracking module, but nothing happened. It gave me the choice of looking at label formats, for all the good that did me. I will remove this waste of memory immediately, wait until tomorrow, and try VERY HARD not to use any profanity. I have been trying to contact USPS online for almost an hour.